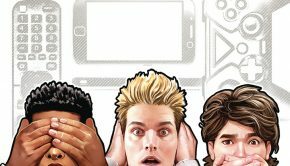 Summary: The third story arc begins! 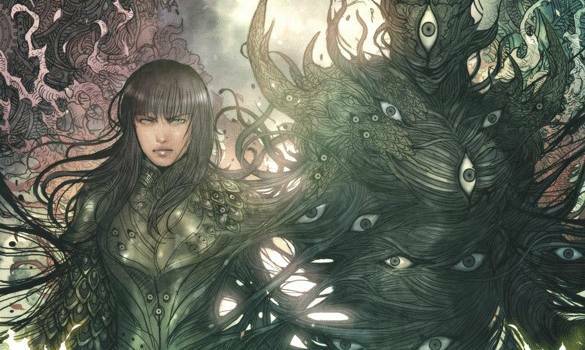 Monstress returns with a new story arc and a gloriously oversized issue! After narrowly escaping the Thyrian Blood Queens, Maika and company make their way to Pontus, where they begin forming plans for the next stage of their journey. Out of desperation, unlikely alliances are forged, as the rumblings of war are on the horizon. We begin this issue with Tuya and Maika passionately embracing. Tuya wishes to talk to Maika about something important, however, Maika dismisses her, only wishing to be in the moment, to enjoy their time together. Maika is then awoken from her dream by Kippa, as they have been summoned by Syryssa, the captain of the ship. The Blood Queen’s are in pursuit, and their ships are gaining on them fast. Luckily for them one of the crew, Old Saw Tooth, is a descendant of an ancient Arcanic, who had been blessed by the wave empress. She enters the sea and sounds a horn, summoning a giant sea monster, called the border warden. The border warden rises from the sea, denying passage to the Blood Queen’s ships, but granting passage to Pontus for Syryssa’s ship. Maika, Kippa and Ren arrive at the Tear Shed, a refugee camp located on one of the islands of Pontus. Once there, Maika immediately begins to plan the next stage of her journey, trying to find a safe way to Thyria and back to the Blood Queen’s. Whilst at a tavern, Maika receives a letter from a mystery “friend”, requesting her presence at a local café. This meeting leads Maika into an unlikely alliance that will hopefully protect both her and her companions. 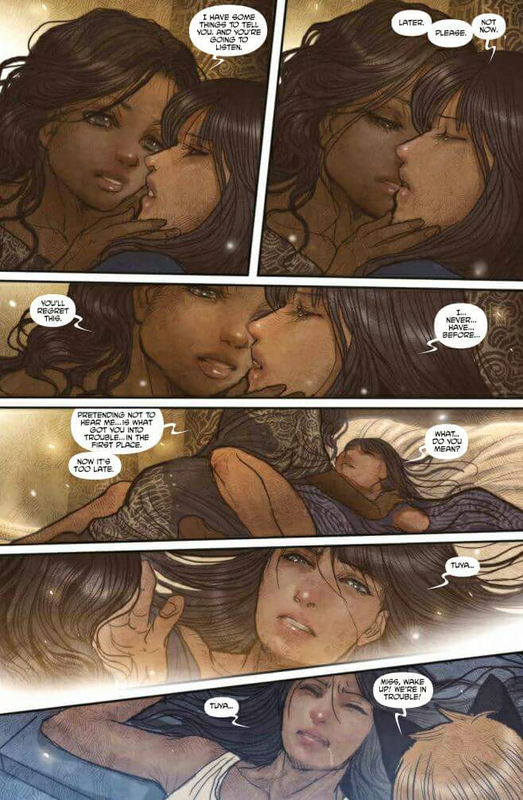 I’m just going to say it…I’m very happy to have Monstress back! This issue is jam-packed with a helluva lot of stuff. Whenever I step back into this world, I always find that I need to quickly flick through the previous issue to remind myself of what unfolded, as each issue will undoubtedly deliver a hefty dose of lore and politics. 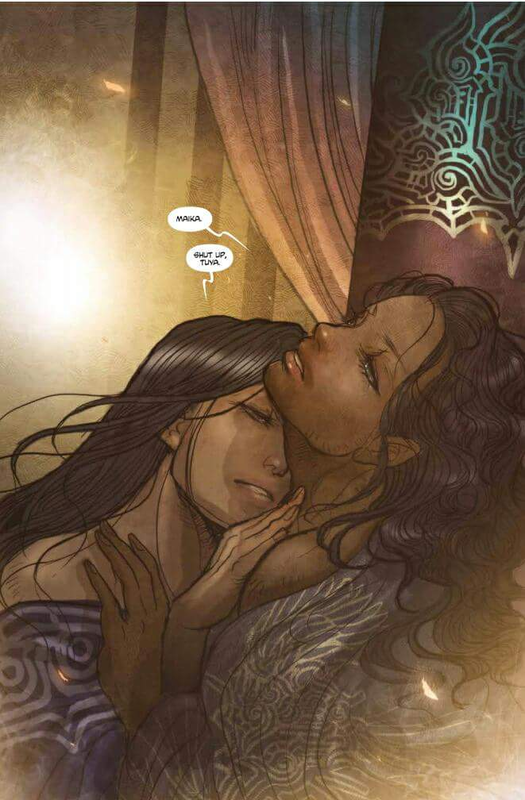 To be completely honest, this is one of the reasons why I love Monstress so much, as Marjorie Liu doesn’t shy away from giving us a deep and complex story. I’ve always thought that this world feels well-rounded, and you can tell that Liu has poured a lot of time and energy into forming a strong and cohesive history. This for me is also reflected in all of the characters, many of whom I’ve started to really love and treasure. 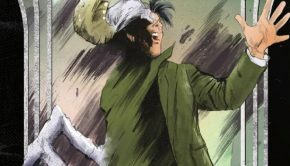 As we enter out third story arc, I’m beginning to see quite a shift in many of the characters, as they are all going through some kind of change or character development. 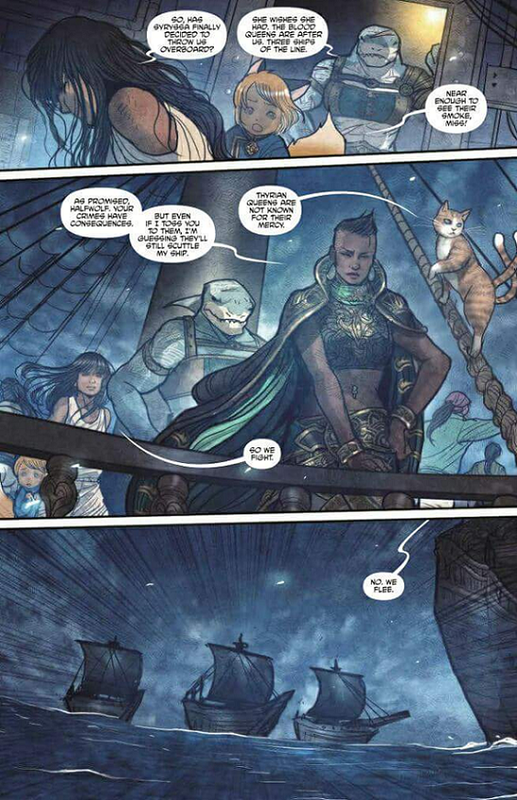 There is also a lot of political intrigue in this issue, as we finally begin to see what Tuya is up to with the Dawn Court. I find Tuya to be a complex character that we know little about, only having had small glimpses of her through flashbacks from Maika. I was also surprised to see that Tuya and Maika were actually lovers, because for some reason I had assumed that they were only close friends. This brings a whole new dynamic to their relationship, complicating Tuya’s betrayal even more so. No doubt their reunion will be an intense and sad one, and I’m looking forward to seeing that encounter unfold. Artist, Sana Takeda is seriously talented. 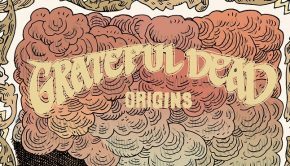 I absolutely love her detailed art, finding that it emanates with a sense of beautiful, vibrant energy. Every aspect of her art is lovely, from the gorgeously drawn characters – seriously, everyone is beautiful in this world – to the grand sweeping landscapes and diverse cities. For me personally, Takeda’s art shines the most when she draws grotesque scenes, with demons and monsters. I just love seeing these beats in all of their twisted and deformed glory. It is during these moments that I fully get to appreciate Takeda’s detailed linework, bringing a whole new dimension to the page. The colouring is lovely and matches the prettiness of the art, bathing this world in a glowing, magical aura. It’s just gorgeous and stunning, and I really love how each page appears to sparkle and glow with light. I actually find that the colouring helps to make this world feel old, giving it an almost aged and weather appearance through it’s glowing haze-like filter effect. 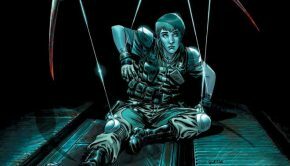 Overall, I thoroughly enjoyed this new issue, finding it to be a great introduction to the third story arc. 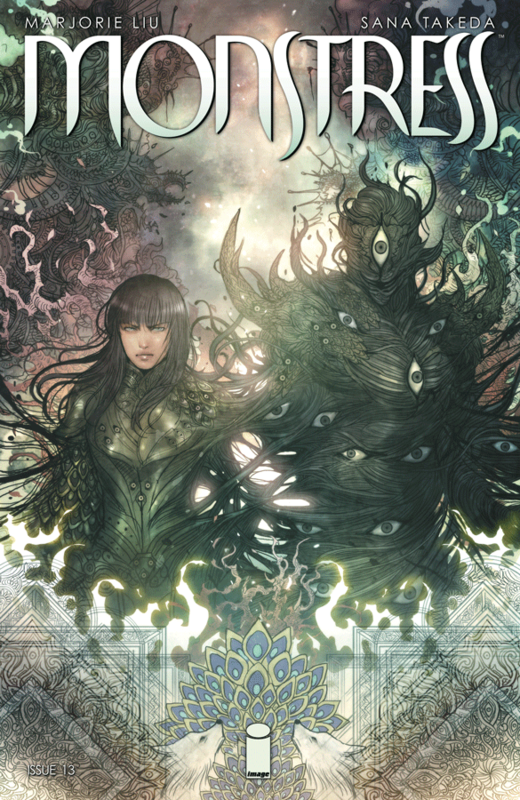 There is a lot going on here, and I do recommend brushing up on your Monstress lore, reminding yourself of what unfolded in the previous story arc. The wheels are in motion, and Maika is stepping into the next phase of her journey. I’m curious to see how this will unfold, and what new adventures Maika and her companions will encounter in the future.